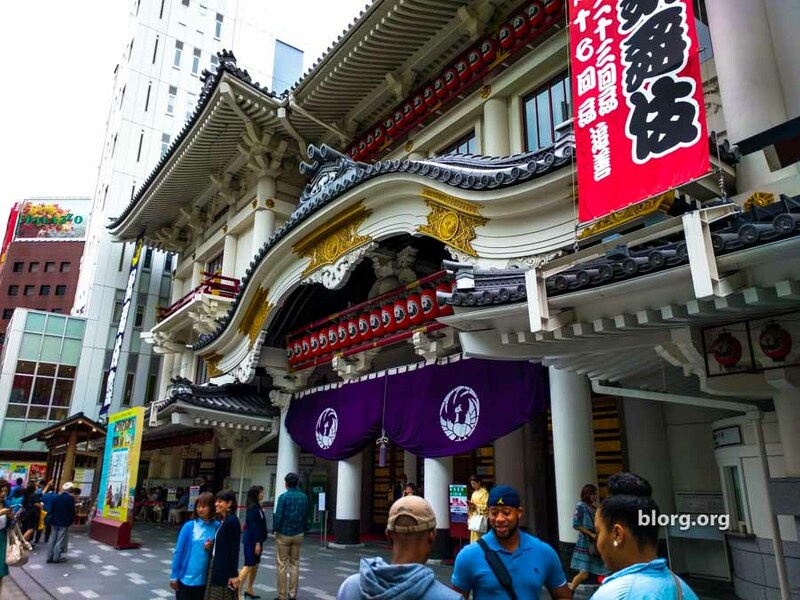 Tokyo Kabuki Theater Show: Boring! On a bright Saturday morning, I made my way towards Ginza for the Tokyo Kabuki Theater better known as Kabukiza Theater. I haven’t seen a kabuki show before nor have I researched what that type of show was about. Surprise me! Typically you have to buy tickets in advance or hope for standby tickets at the last minute. I had hope. They had tickets for the show starting at 11am but it was for the standing section. The show was 90 minutes and I didn’t want to wait a few hours for the next show in hopes for a seat. With a heart full of determination, I purchased a ticket 1500JPY and proceeded to the standing section. I commonly get treated as a local when I’m in Japan or China. People will talk to me assuming I know what they’re saying. I normally think it’s not that important so I respond by nodding politely then continuing whatever the hell I was going to do with no regard of what the person just told me. That’s just how I roll. After being told a long set of instructions in Japanese before entering the theatre, I finally arrive at the standing area. It was situated at the very top of the theatre. You could actually not get a worse place to watch the show. It was so high up I thought I was actually going to get a nosebleed. The stage performers sometimes didn’t move around too much when speaking that I couldn’t tell who was talking. It was too far for me to tell if someone was moving their mouth. I’ve watched a lot of anime and Japanese films with the original Japanese audio so my listening skills are pretty good to get a feel of what’s happening in the story. Those listening skills were useless here. Since the Kabuki play took place centuries ago, I didn’t understand the speaking styles (Masumi had trouble with it too). On top of that, they were talking the Kabuki way. I can only describe it as speaking your entire dialog but imagine getting punched in the stomach throughout your lines. Their voices fluctuated in loudness and pitch. I guess that’s Kabuki style. The show was 90 minutes! The only thing that kept me amused was the ushers escorting customers to their seats. Imagine a ninja walking quickly and low to the ground to avoid being noticed…now replace that with an usher. Now imagine the usher doing that and then a group of customers doing that too right behind them. I couldn’t help but laugh out loud and the most inappropriate times. For the actual show, I was expecting some action since the performers were equipped with swords, bows and arrows. No action. A lot of expectations that I created in my head were not met. It’s like that episode of Itchy & Scratchy driving towards the fireworks factory but they never get there. After the show ended, I made my way out the door with the crowd of people. There was a table at the exit with a display in English saying to return your digital translators here. What the hell!? Alright, that’s my bad for not asking for one. I would have definitely enjoyed the show more if I knew what was going on. There are so many more fun things to do in Japan than going to this kabuki show. Check out all the posts I have on Fun Things To Do In Japan. There are Japanese theme parks, maid bars, ninja bars, maid ear cleanings, magic bars, Virtual Reality Arcades, Owl Cafe Osaka, Horror Bars, Round 1 Stadium Arcade, Video Game Bars, Horror Themed Arcades and more!